Karate is a martial art developed in the Ryukyu Kingdom. It developed from the indigenous Ryukyuan martial arts under the influence of Chinese martial arts, particularly Fujian White Crane. Karate is now predominantly a striking art using punching, kicking, knee strikes, elbow strikes and open-hand techniques such as knife-hands, spear-hands, and palm-heel strikes. Historically, and in some modern styles, grappling, throws, joint locks, restraints, and vital-point strikes are also taught. A karate practitioner is called a karateka. The Ryukyu Kingdom was annexed by Japan in 1879. Karate was brought to Japan in the early 20th century during a time of migration as Ryukyuans, especially from Okinawa, looked for work in Japan. It was systematically taught in Japan after the Taishō era. In 1922 the Japanese Ministry of Education invited Gichin Funakoshi to Tokyo to give a karate demonstration. 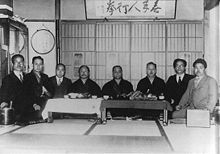 In 1924 Keio University established the first university karate club in mainland Japan and by 1932, major Japanese universities had karate clubs. In this era of escalating Japanese militarism, the name was changed from 唐手 (“Chinese hand” or “Tang hand”) to 空手 (“empty hand”) – both of which are pronounced karate in Japanese – to indicate that the Japanese wished to develop the combat form in Japanese style. After World War II, Okinawa became an important United States military site and karate became popular among servicemen stationed there. On September 28, 2015, karate was featured on a shortlist along with baseball, softball, skateboarding, surfing, and sport climbing to be considered for inclusion in the 2020 Summer Olympics. On June 1, 2016, the International Olympic Committee’s executive board announced they were supporting the inclusion of all five sports (counting baseball and softball as only one sport) for inclusion in the 2020 Games. Karate began as a common fighting system known as “te” among the Pechin class of the Ryukyuans. After trade relationships were established with the Ming dynasty of China in 1372 by King Satto of Chūzan, some forms of Chinese martial arts were introduced to the Ryukyu Islands by the visitors from China, particularly Fujian Province. A large group of Chinese families moved to Okinawa around 1392 for the purpose of cultural exchange, where they established the community of Kumemura and shared their knowledge of a wide variety of Chinese arts and sciences, including the Chinese martial arts. The political centralization of Okinawa by King Shō Hashi in 1429 and the policy of banning weapons by King Shō Shin in 1477, later enforced in Okinawa after the invasion by the Shimazu clan in 1609, are also factors that furthered the development of unarmed combat techniques in Okinawa. Sakukawa Kanga (1782–1838) had studied pugilism and staff fighting in China (according to one legend, under the guidance of Kosokun, originator of kusanku kata). In 1806 he started teaching a fighting art in the city of Shuri that he called “Tudi Sakukawa,” which meant “Sakukawa of China Hand.” This was the first known recorded reference to the art of “Tudi,” written as 唐手. Around the 1820s Sakukawa’s most significant student Matsumura Sōkon (1809–1899) taught a synthesis of te (Shuri-te and Tomari-te) and Shaolin (Chinese 少林) styles. Matsumura’s style would later become the Shōrin-ryū style. Karate, although not widely used in mixed martial arts, has been effective for some MMA practitioners. Various styles of karate are practiced in MMA: Lyoto Machida and John Makdessi practice Shotokan; Bas Rutten and Georges St-Pierre train in Kyokushinl; and Michelle Waterson holds a black belt in American Free Style Karate. Won Kuk Lee, a Korean student of Funakoshi, founded the first martial arts school after the Japanese occupation of Korea ended in 1945, called the Chung Do Kwan. Having studied under Gichin Funakoshi at Chuo University, Lee had incorporated taekkyon, kung fu, and karate in the martial art that he taught which he called “Tang Soo Do”, the Korean transliteration of the Chinese characters for “Way of Chinese Hand” (唐手道). In the mid-1950s, the martial arts schools were unified under President Rhee Syngman’s order, and became taekwondo under the leadership of Choi Hong Hi and a committee of Korean masters. Choi, a significant figure in taekwondo history, had also studied karate under Funakoshi. Karate also provided an important comparative model for the early founders of taekwondo in the formalization of their art including hyung and the belt ranking system. The original taekwondo hyung were identical to karate kata. Eventually, original Korean forms were developed by individual schools and associations. Although the World Taekwondo Federation and International Taekwon-Do Federation are the most prominent among Korean martial arts organizations, tang soo do schools that teach Japanese karate still exist as they were originally conveyed to Won Kuk Lee and his contemporaries from Funakoshi. 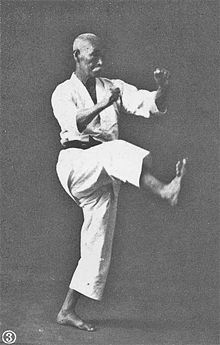 Tsutomu Ohshima began studying karate under Shotokan’s founder, Gichin Funakoshi, while a student at Waseda University, beginning in 1948. In 1957 Ohshima received his godan (fifth degree black belt), the highest rank awarded by Funakoshi. He founded the first university karate club in the United States at California Institute of Technology in 1957. In 1959 he founded the Southern California Karate Association (SCKA) which was renamed Shotokan Karate of America (SKA) in 1969. Vernon Bell, a 3rd Dan Judo instructor who had been instructed by Kenshiro Abbe introduced Karate to England in 1956, having attended classes in Henry Plée’s Yoseikan dojo in Paris. Yoseikan had been founded by Minoru Mochizuki, a master of multiple Japanese martial arts, who had studied Karate with Gichin Funakoshi, thus the Yoseikan style was heavily influenced by Shotokan. Bell began teaching in the tennis courts of his parents’ back garden in Ilford, Essex and his group was to become the British Karate Federation. On July 19, 1957, Vietnamese Hoang Nam 3rd Dan, billed as “Karate champion of Indo China”, was invited to teach by Bell at Maybush Road, but the first instructor from Japan was Tetsuji Murakami (1927-1987) a 3rd Dan Yoseikan under Minoru Mochizuki and 1st Dan of the JKA, who arrived in England in July 1959. In 1959 Frederick Gille set up the Liverpool branch of the British Karate Federation, which was officially recognised in 1961. The Liverpool branch was based at Harold House Jewish Boys Club in Chatham Street before relocating to the YMCA in Everton where it became known as the Red Triangle. One of the early members of this branch was Andy Sherry who had previously studied Jujutsu with Jack Britten. In 1961 Edward Ainsworth, another blackbelt Judoka, set up the first Karate study group in Ayrshire, Scotland having attended Bell’s third ‘Karate Summer School’ in 1961.